Seed collection and preparation: Seeds should be collected at the appropriate time, when pods, cones or fruit have ripened sufficiently. Pods, capsules or cones can be collected just before seeds are released– further drying will often cause them to open so the seeds are easily shaken out and collected. If the seed capsules are already open and still contain seeds, the seeds can be shaken into a bag. The preparation of seeds contained in fruit is more time-consuming. The fruit needs to be macerated (softened and mashed). Sometimes it helps to allow the fruit to begin to rot in a bag or to soak in water. To extract the seeds from the fruit, gently mash the fruit to separate the pulp from the seeds in a bowl of water. Most viable seeds will sink to the bottom and can be separated by swirling the pulp and water mixture and successive decantations, leaving the seeds on the bottom of the bowl. Some seeds, such as Salal, will float and even resist the surface tension of the water, and need to be skimmed off the surface of the water. (Sometimes it is easier just to mash the fruit and spread it, pulp and all, onto the growing media.) For some species, seeds from fruit should not be allowed to dry out but should be planted immediately or stratified as necessary. For plants that produce nuts, such as hazelnut, it is often difficult to find ripe nuts before squirrels or other animals. Sometimes nuts are produced that have no viable seed inside, therefore, before going to the trouble of planting these, the nuts should pass the “float test.” After placing the nuts in a pail of water, only plant the ones that sink to the bottom. You may crack a few open to check to make sure the test worked properly. Propagation of Native Plants: Native plants may be propagated by seed or by different methods of asexual propagation. A little bit of research on each species ensures the greatest success, by learning and using methods that have been successful by others. Stratification: Many of our native plant seeds need to go through a cold period before they will germinate. Some need a warm period prior to the cold period. This kind of seed treatment is called stratification from the Latin “to layer.” The easiest way to stratify seeds is simply to mimic the conditions the seed would encounter in nature. For many plants, simply sowing the seeds in the fall and leaving them out through the winter will work. If you need to, you can stratify seeds by placing them in a moist media, in an open bag (they need oxygen! ), in a refrigerator for the appropriate amount of time. Asexual propagation: The most common method of asexual propagation is by stem cuttings. Cuttings may be dipped in a hormone treatment such as IBA (indolebutyric acid) to aid in rooting and then stuck (right side up!) in an appropriate media, such as sand, peat moss, vermiculite, perlite or regular potting soil. More difficult plants may be propagated by layering; where a branch that is still attached to the tree or shrub is bent down, and covered with soil to encourage root growth. Wounding by scarring or notching the bark prior to burial may aid this process. Plants that produce many stems may simply be dug up and divided as long as each piece has sufficient roots to sustain it. Seeds that you have sown may need to be protected from foraging rodents and birds. Covering them with a floating row cover may help discourage the birds and keep out weed seeds too, but it may be necessary to set out traps or bait, to protect them from rodents. Emerging seedlings and cuttings may also need protection from slugs and rabbits. 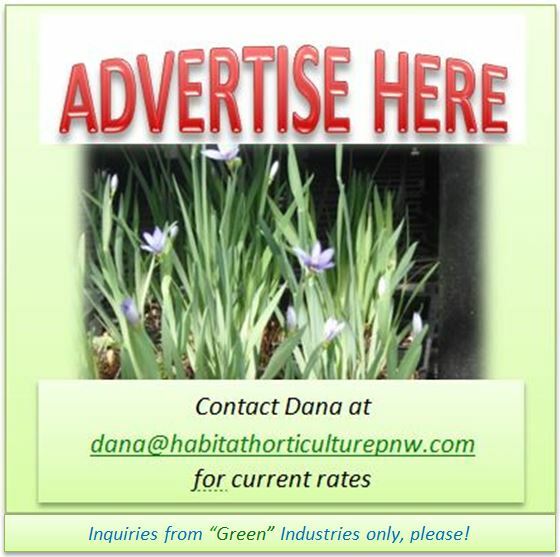 This entry was posted in Native Plant Information on January 27, 2014 by habitatdana.